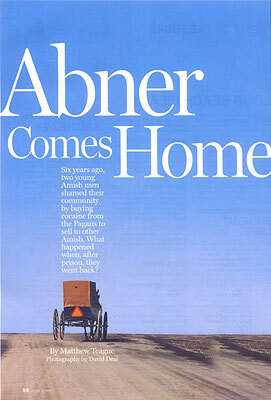 Latest News	» PA Super Lawyers 2008 "Abner Comes Home"
In a landscape of simple white farmhouses, this one stood apart. Simple, yes, White, yes, Farmhouse. But the flashy snowmobile out front hinted at something else. Abner Stoltzfus, probably the most notorious Amishman alive, moved into the upstairs of this house after his prison stint. When I knocked on the door recently, Abner opened it with a warm smile “Come on up,” he said, without asking who I was, as though he had been waiting. He turned and walked up green shag-carpeted stairs with a slight limp, the residue of a childhood spent in leg braces. I supposed aloud that he was no longer Amish, judging from the big diesel pickup parked outside, the snowmobile, computer, pack of cigarettes on the kitchen table, clear plastic phone so you can see the guts of the thing. Sweatshirt and blue jeans, baseball cap. Something in the eyes. Something of the world. “Nah,” Abner said, as thou shrugging off the old life. No longer Amish. With that, he sat down at his tiny kitchen table and spoke openly, for hours. The public had only known the absurd punch line, back in 1998: Two Amish guys named Abner Stoltzfus (not related) had bought a whopping one-and-a-half kilos of cocaine from a biker gang called the Pagans. Then they distributed it to other Amish kids at parties called “hoedowns.” But the Amish are a close-mouthed people in general, and the Abners were silent in particular as the saga unfolded. Now, as the sun from the window eased across his kitchen floor, the words seemed to tumble from Abner, a relief to finally describe the downfall and the intrigue, the shame and the secret meetings. Sometimes he stuttered slightly, and he winced during the embarrassing parts, but mostly he spoke with the bemused manner of a man recalling some odd adolescent lapse: Can you believe I did that? Afterward he took a long pause and sat back from the kitchen table. “You ever been on an Amish farm?” He knew I hadn’t. Few outsiders have. So why did he ask? What could he want to show me there, and why – as an outsider himself, now – would he dare? In his truck, Abner settled into the driver’s seat as though it were a leather armchair. He cracked open the driver’s window and reached for a cigarette, which he lit with tender attention, drinking down the smoke. He checked his cell phone for messages and turned up the radio. He did these things with relish, a prince in exile who surrounds himself with the world’s luxuries. The smoke finally reappeared, leaking from his nostrils in two silver strands. 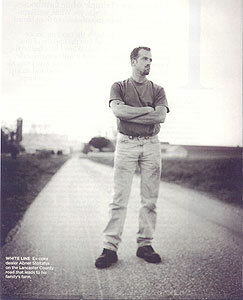 Abner left the Amish shortly after the year he spent in prison, in 2000. “I just don’t believe you have to live that way,” he said. Abner’s drug-dealing partner, whom we’ll call Abner X. Stoltzfus, joined the Amish church through baptism after serving his sentence and married an Amish girl, Lydia Reihl, who had written to the judge on his behalf and then stood by him during his imprisonment. I asked Abner whether he has a girlfriend. He laughed and looked away. He’s a handsome guy, with close-cropped hair and a dark complexion. “I guess I’ve got a lot of girlfriends,” he said. Along the road, people waved at Abner constantly: a woman on a tractor, a man in a truck, a man in a field. Everyone knows him. We passed the Gordonville Volunteer Fire Department, where Abner works as a firefighter. He recently campaigned for the local assistant fire chief’s position, and jokes that he lost by a single vote. “Stupid me. I had voted for the other guy,” Abner said, laughing. You can take off the wide-brim hat and shave the beard, but Amish manners last forever. Traveling through Lancaster County feels like disassembling time, with every pasture a year and every rise a decade, so that the county’s middle seems to reside a century away. The houses grow stonier and simpler, with no cars out front, with drying lines strung from homes to barns and the pure white shirts crucified, the hanged pants and dresses, the tiny children’s versions. But not the underwear. Never the underwear. The Stoltzfus dairy sits just a mile or two from Abner’s place a short trip even in a buggy. Abner killed his truck’s big diesel motor next to the barn, and silence came rushing in. He pulled a couple of gulps from his cigarette and stubbed it out. He glanced around for his father, then stepped inside the barn, which was immaculate, with pristine floors and tidy racks of tools. About 50 head of cattle stood in their stalls, quietly shuffling. Abner showed them off, bending to stroke the head of a newborn calf. The horses stamped in their stalls, waiting for their yokes and the inevitable turning of the soil. Then Abner’s father, John Stoltzfus, backed into the room sweeping. As a child, Abner would ride to church in the rear of his parents’ buggy, clopping along country roads. While his father worked the reins, Abner would lift up a black cloth flap in the back to watch sports cars flash by. So sleek. So loud. He loved them loud. Those freewheeling Amish guys were enjoying rumspringa (“running around”), a phase that starts at age 16 and stretches until they decide to be baptized into the church, or not. During rumspringa, Amish teens move among outsiders, whom they call “they English,” giving them a chance to sample the world before deciding whether to devote themselves to Amish life. They join “gangs” ranging from the conservative Parakeets to the looser Pilgrims. It’s a centuries-old idea, that someone can only choose baptism as an adult, when he can opt not to accept the world’s influence. So, the Amish reason, how can a young person choose to give up something he has never experienced? Their plan works. Ninety percent of their teens come home. Abner started up his own roofing company and put aside enough money to buy a car just before he turned 18. He drove it home to his parents’ farm and parked it far from the house, out in a pasture. His father stepped from the house and saw it: a gleaming monster – red Thunderbird – jacked up in the rear-up on its haunches–Father forgive him. Abner ambled up and waited for his father’s word. “Just don’t park it near the house,” he said. “Son… don’t be too bold.” Then he turned and walked inside, leaving Abner to think. Was this approval? Disappointment? One weekend, Abner and a friend traveled out of Lancaster County to see a demolition derby, an exquisite Amish splurge, almost pornographic, to watch perfectly good cars smash into each other. At the derby, Abner’s friend saw an English neighbor from home, whom Abner describes as “a long-haired hippie guy.” He needed a ride, so Abner and his friend obliged. Nah, Abner said. He’d seen plenty of cigarettes. No big deal. We’re worldly guys. The Amish pair furrowed their brows. No, no, Heh heh. Nah. By the time they dropped Long-Hair off, they were all loopy. Abner bought 20 bucks’ worth of pot from the guy and smoked it immediately. The rush. Cocaine flows through an Amishman’s bloodstream the same as anyone else’s. The Abners snorted more and more, working together on roofs during the week and inhaling their profits on the weekends. Abner X. took Abner to meet his source for the coke: the Pagans. The Abners’ lifestyle accelerated, snorting and selling now, pushing coke to other Crickets and Antiques and Pilgrims. Abner said they never thought about illegality, or morality; “To us, it was just a different drunk,” he said. Sometimes they bought just a couple of thousand dollars’ worth. And on some weekends, when they organized massive 500-person hoedowns, they’d make a bigger buy. Six thousand. Seven thousand. Eight. It went on for two years. The Abners were cocaine dealers, yes, but they weren’t good at it. They would put out whole plates of the stuff on a hay bale and let their friends take what they wanted, confident they would pay later. The honor system, it turns out, didn’t make for efficient coke dealing, and the Abners started losing money fast. But the hoedowns were a hit. In his apartment, Abner had stepped to a drawer in his kitchen and pulled out a pack of photos. They showed Amish kids hanging out around a barn, drinking and grooving to the sounds of an Amish rock band with electric guitars, drums, and sweat in their eyelashes. The girls wore bonnets and had bare feet, surrounded by beer cans on the ground but covering their mouths as they laughed. Abner gazed at the photos a long time before setting them aside, seeming resigned in some way. He picked up his keys. Time to take me to the family farm. The swick, swick of a straw broom announced Abner’s father, John Stoltzfus, as he swept his way into the room. He stopped when he saw Abner, and his face broke into a wide grin, the smooth upper lip curling over the long dark beard. I wasn’t sure why Abner had brought me here until his father caught sight of me. The father reached out and shook my hand. I realized Abner hadn’t brought me here to show me something, but just the opposite: He had brought me here for his father’s approval, and received it. “Come inside,” he said, setting his broom aside. The father’s warmth surprised me, and confounded the world’s expectation of the Amish. They seem so stern to outsiders, glowering at tourists from their plows along Lancaster roadsides, so strict and faithful to the Ordnung, their rules for behavior. But pain is pain and love is love, and the Abners had pricked a flow of both, the Amish embraced them in the only way they knew how. Abner X. Stoltzfus’s father Aaron wrote a heart-wrenching confession to the judge in Philadelphia alluding to his son’s rebirth in Christ. To his Parents and the Community. Plus he does not like to miss church. “Worse than prison, worse than any of it, was the shame.” Abner had said. “I embarrassed my father. My Family. My mother had dark hair before all this.” But this hardened community cradled the Abners in its bosom, and continues to protect them even now. As I searched for them recently, I heard the truthful Amish finesse the truth at every turn: “Oh, well, my. There are many Abner Stoltzfuses here….” Strictly true. And Abner X. seemed to enjoy special protection as a baptized member of the church, so that at every corner I saw the heel of his hobnailed boot, the flutter of his coat, and then he was gone, disappeared. Eventually he sent word that he, like most Amishmen, didn’t want to be written about. At the Stoltzfus dairy, Abner and his father traipsed across a yard toward the father’s home, a large white two-story. Abner’s grandfather lives in an identical house just behind it, and his brother lives in another one beyond that. Around the family compound, rich, heathery pasture stretched in every direction. Abner could have had this, a portion of the farm and a quadruplet house, with the same simple roofline and inviting front door. I pictured him standing with a scale in his hand, balancing the Amish homestead on one side and a pack of cigarettes on the other. No: the option of cigarettes. At first, leaving the community was hard, he said. No one screamed. No one yelled or cursed, or disciplined him. But a quiet knowledge filled the farm: Abner’s ways were not the old ways. It felt like plowing in winter, straining against unbroken ground. He was an Amish man, behaving wrongfully. But once the ground broke, the straining stopped. Suddenly he was an English man, behaving admirably. “It was fine once they accepted that I was gone and wasn’t coming back,” he said. Which is a curious description, considering that Abner never actually went anywhere. Not geographically, at least. He still moves about the Amish community every day. The father and son still walk together from barn to house, smiling, pointing at this rabbit, listening to that bird, feeling warmth from the same sun. Inside the house, Abner’s mother and teenage sister welcomed us into the living room while the father slipped off his mucky boots. The mother’s hair glimmered under her bonnet: silver now. She and Abner’s sister stood with hands clasped, and seemed to wait for something to happen. How long had they waited? Everything about them, their coloring, the texture and style of their clothing, their posture, gave the impression they had climbed down from a Vermeer painting. Especially Abner’s younger sister, who must know at least something about the world outside. The Milkmaid, or The Girl with a Pearl Earring. No: Woman Holding a Balance. It was here, into this serene scene, that a man intruded seven years ago with a knock at the door. He introduced himself as a house painter new to the area. He wanted to work with Abner, he said, and left a business card behind. When Abner met with him later, the man revealed himself not as a painter, but as an undercover drug agent. The FBI and state police were investigating the Pagans, he said, and a name — or was it two names? — kept cropping up on their wiretap: Abner Stoltzfus. Now the cops wanted something from the Abners. Something dangerous. In Amish culture, bishops and elders hand down all social perspective. They dictate how to dress, how to travel, how to work. Especially when it comes to missing with “worldlings.” For an authoritative view of the Abners and their place in society, I visited a farm belonging to Sam Stoltzfus, in Gordonville. He’s an elder in the community, not related to the Abners but familiar with their case. From Sam Stoltzfus’s farmhouse stoop I could see the whole of the Amish panorama, surrounded by ancient farmland. Geologists say it’s the finest in the world, a green patchwork quilt spread over the bedrock. Tourists love Amish furniture for its simple solidness, made with no more wood than necessary, hewn in the old ways. But the furniture is only an extension of the Amish philosophy: they eat, pray and speak in the same way, without a moment or word to spare. It makes for blunt conversation at the table. While Sam and his teenage sons slurped their soup, the elder asked in the straightforward Amish way about my church background. I told him I’m Southern Baptist, and wondered aloud how we, a Protestant and an Amishman, can have such similar doctrinal beliefs—the basic tenets of Christianity—and yet look so different and act so differently. “Oh yes you do,” San said. “You voted for it there at your Triennial Convention. You certainly did.” He smiled happily and continued with his bread. Later I looked up the Triennial Convention, and sure enough, there it was: held in 1841 in Georgia, where one faction of Baptists accused another faction of plotting against slaveholders. Throughout the meal, Sam whipped the discussion through the centuries without effort or notice. It’s a curiosity of life among the Amish that time and distance seem to compress and elongate at turns, like taffy boiled down, then stretched thin. One Amishman—a gazebo-maker—once gave me directions to a meeting at the top of “Sheep Hill,” the first hill off a major road. I turned off the road and climbed the hill, higher and higher, a small mountain. But the place called “Sheep Hill” by the Amish, it turned out, was the small hump at the bottom of the mountain. When you’re gripping the reins of a buggy, time and distance take on a new deliberation. Same for when another Amishman, a farmer, told me he “kept in touch” with one of the Abners. He mentioned later that they hadn’t spoken in two years. The Amish trace their roots to 16th-century Zurich, he said, where a group of fiery students felt the Protestant Reformation needed to “get on with it.” The authorities chased them down and hacked them up, drowned them, burned them and cast them into prison. The sect learned to dodge cities and industry and stick to farming in the countryside. Cities and technology came to represent threat and danger, associations that linger with the Plain community even today. “We wanted to be a little more separate,” Sam said, as though he had been in on the decision. “We are to be a ‘peculiar people.’ That’s what Peter told us, so that’s what we do.” He yanked a callused thumb over his shoulder, as if the apostle Peter worked at the next farm over. Abner pulled over his truck at the nearest gas station and searched for a newspaper—none to be found. And none at the next store, or the next, or the next. “I tried seven paces before I found a paper,” Abner said. The Amish avoid television news, but by gum, they’ll make a run on newspapers when word gets around. And there it was, on the front page of the local paper: Abner Stoltzfus and Abner Stoltzfus, charged with drug dealing along with the Pagans. What’s going on. What’s going on. What’s going on. The words clanged in Abner’s skull for years afterward. The shame. His father never struck him, never cursed him, never raised his voice. A blow to the head might have felt better. Anger. Rage. All straightforward emotions. But the father was only bewildered, and sad. The Abners’ bravery during the sting had impressed the FBI and police. Pyfer, the lawyer, devised a plan to further polish the young men’s image. They would hold a drug awareness meeting, where the Abners could warn other Amish youths to avoid cocaine. “I’ll admit it was a lark,” Pyfer said. “We needed to do something to make these guys look good.” There was no publicity for the meeting, and no notice in the newspapers. Only the Amish were invited, by word of mouth. Pyfer expected around 60 to come to the local fire hall and hear the Abners’ story. Three hundred showed up. The only frame of reference the Amish had for such a gathering was church. So the young women sat on one side, the young men on the other; parents sat in the rear, and elders sat together. They opened with a prayer, then sang a hymn. The FBI agent gave his testament, then Pyfer, and finally the Abners. Midway through the meeting, Pyfer realized his lark had turned into something important. Something powerful. Toward the end, an Amish girl stood up. She had something to say: She, too, had suffered an addiction to cocaine. It’s real, she warned the elders. It was an extraordinary step, for a young Amish woman to presume advising the bishops of her faith. But she spoke up: We have a problem her in heaven on earth. After that first meeting, Pyfer realized the Abners were only one facet of a huge, naïve culture; they just happened to get caught. Pyfer, the police and the Abners organized another meeting, and then another, and over nine months they wound up holding a dozen clandestine meetings, in barns, abandoned stores and houses, attended by a total of about 12,000 Amish people. Despite such epic numbers, no local newspaper caught word of the meetings. “We really wanted to keep things secret.” Pyfer said. 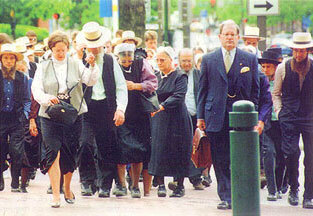 On the day of the Abners’ sentencing, in June 1999, a flock of 300 Amish faithful walked down Market Street to the U.S. Courthouse. They had, extraordinarily, rented a fleet of vans and ridden into the City of Philadelphia, with its strange sounds and sights and smells. Buildings leaned in on them; cars careened on all sides. The long corporate Amish memory bore down on them; cities and technology, beheaded and stoned. In the courtroom, Judge Clarence Newcomer and his deputy clerk, Mike Finney; marveled at the number of Amish supporters. The crowd overflowed into the hallway. It didn’t make sense. The Amish are famous for “shunning” church members who stray, yet they turned out in droves to support two of the worst offenders in the history of the sect. They wave to Abner as he roars past their buggies in his big diesel truck. More often, the Amish act according to push vs. pull. They avoid things that push the community apart, and embrace things that pull it together. For instance, electricity is not, in itself, evil. But if you’re up late at night watching TV, you probably won’t make it out of bed at sunrise to milk the cows. So the whole community suffers. Old Sam Stoltzfus with his century-crossing memory fears the Lunch Pail Threat, not because non-farming jobs are wrong, but because they take fathers away from their families during the day. “Let’s say you and I are standing here talking and your cell phone rings,” Seibert said. “You’re going to answer it, and that makes me feel less important.” So the phone, in tiny increments, pushes each member of the community apart. Most English misunderstand shunning, too. They thinks it’s a way to cast people from the community without aid. But it’s the opposite: When an Amish congregation excommunicates and then shuns a member—usually for an offense coupled with an unrepentant heart—other members are supposed to give him help or food if he needs it, but can’t receive his help or services while the shunning lasts. So that’s the most dreaded punishment in Amish culture: not being able to help out the community. “They knew.” But with the Abners, he was more lenient; a year in prison, and then five years’ monitored release. Later, when Abner finally came home from prison, his father greeted him with a warm welcome and a piece of paper. “What’s this?’ Abner asked. After a mild Amish joke, one about Abner working on roofs for a living and a Bible verse about the misery of life on a roof, the laughter subsides, and it’s time for us to leave his father’s house. Before we go, they approach for a quick, wordless embrace. The two men make easy company. Neither owes the other. Abner did pay back his debts, which took years, yes, but after all the shame and the sorrow, such firm forgiveness feels warm and soft, like sunlight on his face. His father could have cast him aside altogether. A drinker. A liar. A cocaine dealer. Instead, embracing, the father and son embody all the lovely backwardness of the Amish paradox: Abner’s father holds him closer than many fathers with blameless sons.